For women, having trimmed waist is an appealing asset. Exercising and maintaining a healthy diet can help you to achieve a small waist size. But the best waist trainers can also help to achieve your desired body shape by gently molding the contours of your body. Best of all, waist trainers are designed to be comfortable and wearable. You can wear it anytime you want, underneath your office uniform! Along with proper exercise and diet, using waist trainers will help you to trim your waist. Not to mention, it’ll also hide unwanted flab in your belly especially if you want to wear a fitted dress. The Shape of You waist trainer corset is constructed using latex, cotton, and some steel. This corset provides optimal comfort even if you wear it the entire day. It remains stable without also putting much stress on it. Aside from that, rest assured that this cincher is not itchy or uncomfortable. Having made of 100% premium cotton interior layer, this is the corset that you can even wear to work or when doing strenuous activities. The waist trainer will help you to achieve the body shape that you wanted. Its outer layer of rubber latex supplemented with nine reinforce steel bones helps to maintain the shape of your body and the corset. The manufacturer recommended wearing this corset during daytime only. Check out the Camellia’s women corset. This is made of cotton and mesh. With its strong hygroscopicity, rest assured that you’ll feel relaxed and comfortable when wearing it. The fabric is breathable, so it does not cause sweating and bad odor. It has busk closure, and the back design has traditional lace-up closure. It has 16 flat and spiral steel bones to support and trim your waist. Thanks to this short torso waist trainer, you can control the flabs in your stomach and slim your waist. Achieving the ultimate hourglass shape has made easy with this waist trainer. It also has compression built around your waist and belly to stimulate fat burn, especially if you’re working out or you wanted to shed weight after giving birth. The steel bones, on the other hand, works by providing robust support to your lumbar, lower, and middle back. It also helps to correct your posture. Its Modesty Panel allows you to show or conceal your back for tight lacing. If you have a short torso, you should check out the Camellia’s women steel boned corset. This provides an excellent fit for petite women with a short body. 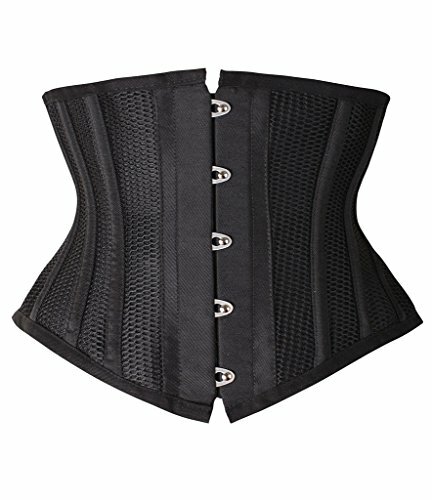 The underbust corset features 26 double steel bones to support your lumbar and help you achieve your desired waist length. There are four steel bars in the back and two steel bars adjacent to the front busk. Thanks to its four layers of fabric made of cotton, rest assured that it is airy and does not cause excessive sweating when worn. This corset is ideal for massive waist trainer. It builds compression around your waist and can stimulate fat burning when you’re working out or maintaining a diet. It can also help to shed the weight you’ve gained when you were pregnant. This corset can also act as a posture corrector. Make sure that you reduce at least four inches of your actual size when choosing your corset size. The True Corset steel boned waist trainer features ten high-density steel bones (six spiral steel and four flat steel bones), allowing you to reduce at least five inches of your waist size. It has steel busk front closure, six-inch-wide modesty panel, ten-inch front, and back length, and lace up back with strong laces. Thanks to its sturdy outer cloth reinforced with a fused fabric and lined with three layers of premium 100% cotton, this is ideal for those who are starting to train their waist. 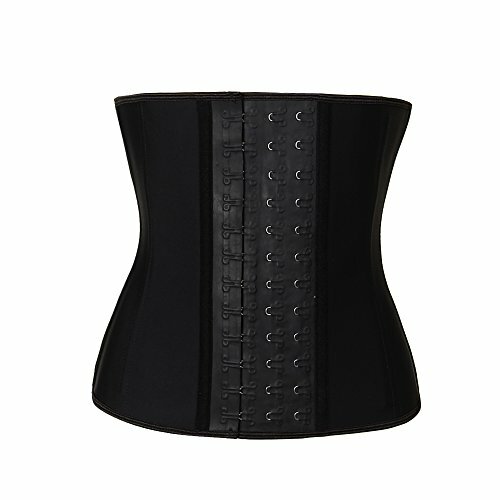 This corset can also work by improving your posture and concealing the flab in your belly. Thanks to its sleek black design, you can use this as your Halloween costume. This waist trainer works well if you are under gym training or maintaining a healthy diet. It can also be used to express your sexuality. This burlesque corset can be used daily underneath your office uniform. Check out the Trust Corset waist training shaper corset. It features 26 high-density bone details. It has four layers of clothing—Taffeta outer layer, two reinforcing cotton middle layers, and extra-strength cotton inner lining layer. It is designed to trim your waist and conceal stomach fats. With proper diet and regular exercise, you can reduce up to seven inches of your waist size. This corset can support your weight loss program. It also helps to improve your posture and stimulate the burning of fat when worn. Since it’s made of cotton, the corset is not uncomfortable to wear. You can use it daily underneath your office uniform. You can check the corset measurements diagrams in the images to select your most accurate size. The size chart also includes the sizing instructions for your guidance. If you are on a budget, check out the Lover Beauty women’s underbust corset waist training cincher. It is made of cotton, spandex, and latex. This corset features nine spiral steel bones and keeps your posture. The steel bones are made of plastic, so it can bend easily and follow the natural contour of your body. It also has three hooks waist training corset, making it easier to wear. The enclosed boning in front and back adds support to your lumbar area. Trimming down your waist had been made easier with its three columns hook-and-eye closure classic design. You can adjust the size to make it more comfortable to wear. It also provides high compression and ideal to use for women with a long torso. With proper diet and exercise, you can reduce up to five inches of your waist size when wearing it. Make sure that you select the right size using the provided size map for a perfect fit. Another product from True Corset, we have the Playgirl Label steel boned waist trainer corset. It features 14 high-density bones (10 spiral steel and four flat steel), allowing you to achieve a trimmed waist. This corset is made of three layers of cloth. The Taffeta outer cloth has premium 100% cotton lining and its additional layer of fabric fused to the taffeta is added for durability. It has a 16-inch back length, 14-inch long steel busk front closure, and six-inch modesty panel. You can lace it back up using its durable laces. By wearing this waist trainer, you can reduce up to five inches of your waist size. It can also get rid of your back rolls and stimulate fat burning in your midsection area. Take note that this corset is ideal for women with 5’6 in height and has a long torso. Are you looking for a corset this Halloween season? Check out the BSlingerie gothic steampunk waist cincher underbust corset. This vintage style corset is everything you need to look daring this Halloween. 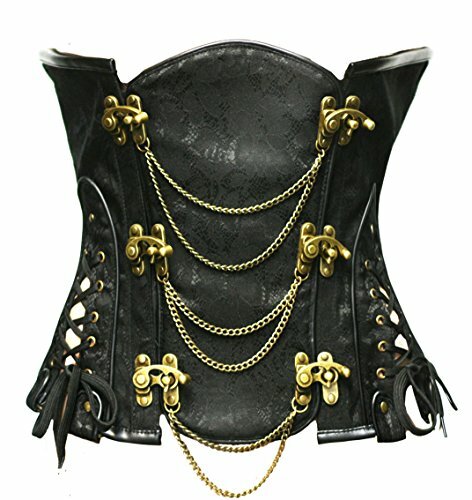 The steampunk corset is composed of heavy-duty steel bones to support your back and midsection. This vintage corset is available in brown, red, green, and black color. It is constructed using polyester and spandex. If you want to adjust the size, you can use its adjustable lace-up closure in the back. It helps you to achieve an hourglass shape and trim your waist with proper eating and exercise. You can pair it up with jeans, dresses, or use it as your Halloween costume! Another product from Camellia’s Corsets, we have the 26 steel boned heavy-duty waist trainer corset. It features 20 spiral steel bones, four rigid steel bars for back support, two steel bars adjacent to front busk. The corset also has a strong corset cord lacing back in ribbon lacing. If you want to achieve an hourglass shape, you should consider this solidly built heavy-duty waist trainer. It is composed of four layers of fabric: two inner layers of premium cotton, a laminated layer, an outer layer for added durability. This product works by improving the result of your hard work at the gym. It can support weight loss, control your stomach flab, and trim your waist. Most customers claimed it is also useful for post-pregnancy weight loss. Thanks to its sleek design, you can also transform this corset into your Halloween costume and can be worn daily at work and gym. 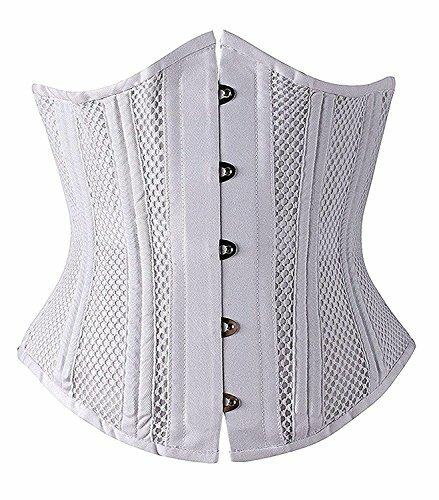 This corset is ideal for women with a long torso.